Being that it is the season for giving, I feel it necessary to shine the light on and give recognition to a person out there who volunteers for organizations and humbly accepts the fact that her efforts may go unrecognized by the general public. However, in the large scheme of things, it’s those people who make the biggest impact in our lives. Among those volunteers is Jennifer Davis (33) of Jacksonville. 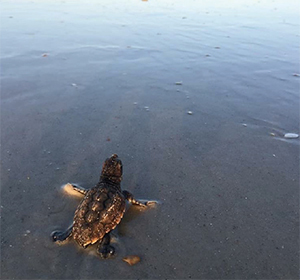 She is one of many locals who are working tirelessly to help save our turtle species and preserve the beaches here along the coast of Northeast Florida by volunteering for Eastman Environmental and the local Beaches Sea Turtle Patrol. 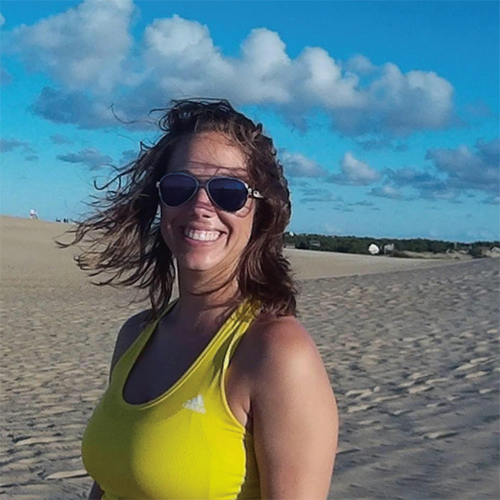 Jennifer began volunteering for Eastman Environmental in 2011 working as a turtle patrol monitoring the beaches in the St. Augustine area. Since then she has only increased her role in the community. By 2014 she had joined the Beaches Sea Turtle Patrol that monitors Atlantic Beach, Neptune and Jacksonville Beach. Duties for both organizations are pretty much the same. 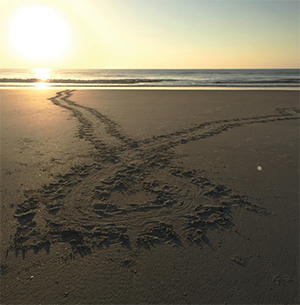 During nesting season, May-October, she is assigned to one morning a week for each group to walk the beach and monitor existing nests as well as detect any new turtle tracks that may be present in the sand by identifying the characteristics of tracks as well as the nest. If there is anyone local who knows the latest happenings in the area, it is Davis. With coffee in hand, I was able to catch up with her one morning to get a glimpse and observe what she and the local turtle patrol do. We waited for the sun to peer over the horizon then we began walking Atlantic Beach down through Neptune Beach on her patrol. Due to the local beaches re-nourishment project, we did not come across any existing nests or new turtle activity. With the dredging of Jacksonville Beach, any nests that were present on the beach had to be carefully relocated to Atlantic Beach. Along our walk we did however pick up an obscene amount of trash from litterbug beachgoers and filled in massive man-made sandpits that had been left behind. While cleaning up the beaches Davis did mention something that I found fascinating. They began DNA testing local turtles for research. The process allows them to locate the clutch, take a freshly laid egg and send it off for the DNA testing. This information has allowed them to identify the type of species and potentially tie it to other nests laid by the same mama turtle. This year the DNA information collected showed that one mama turtle laid 4 nests from May-June stretching from GA to just south of Jacksonville! Wow! What a breakthrough they have made. Countless hours have been dedicated to saving the turtle species and it’s refreshing to know that there is good in the world, and there are amazing people that are willing to put their lives on hold to help do something for the greater good. Yes, these people really do exist and we owe them the recognition they deserve.